Length: 7.5cm Height: 12.5cm (5 inches). 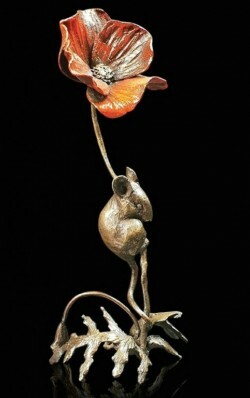 Beautiful and unique mouse sculpture by Michael Simpson. Limited edition of just 250. All bronzes are produced using the lost wax method. Each bronze is decorated and finished using the traditional method of patination and comes beautifully boxed with a certificate of authenticity. The certificate also includes info about the artist and the edition number eg 7/250. Robust and heavy ornament made from solid foundry bronze (not hollow).